The Department of Education (DepEd) accommodated all the Alternative Learning System (ALS) implementers through an engagement with the theme, “KUMUSTAHAN SA ALTERNATIVE LEARNING SYSTEM” on April 25, 2018, Bulwagan ng Karunungan, DepEd Central Office, Pasig City. Honorable Leonor M. Briones, DepEd Secretary through a video message, shared on the development of ALS and reiterated on the adjustment of the cut – off score from 75% to 60% making to Eighty Eight Thousand (88,000) passers that contributed a lot to One Hundred Ten Thousand(110 000) more Junior High School (JHS) completers. Secretary Briones added on her speech the expansion of the coverage of ALS focusing not only for literacy and reading but with livelihood skills training. The engagement was highlighted by the message of Hon. G.H.S. Ambat, Assistant DepEd Secretary. 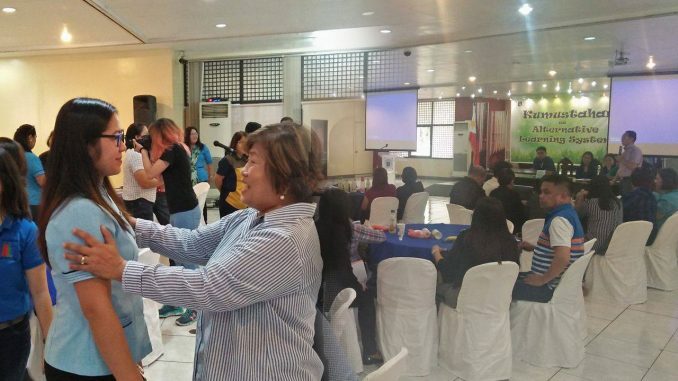 “About Five Thousand Mobile Teacher Items are to be deployed all over the Philippines based on the data gathered during the literacy mapping”, she said. Issues and concerns were presented by different divisions in the region and through the inputs given by the Schools Division Superintendent (SDS) of the Division of Pasay City, Dr. Evangeline P. Ladines, most of the participants were enlightened that the ALS programs and projects must be included in the appropriation of budget of the division. The engagement was attended by ALS key program implementers in Pasay City like Dr. Evangeline P. Ladines, SDS; Dr. Melody P. Cruz, OIC-Assistant Schools Division Superintendent (ASDS); Mr. Librado F. Torres, Chief, Education Program Supervisor- Curriculum Implementation Division (CID); Mrs. Edna P. Madrid, Education Program Supervisor (EPS) –ALS; Mrs. Sharon May Q. Abdillah OIC- Accounting Unit; Mrs. Cecilia D. Baylon, Planning Officer III; Education Program Specialist II-ALS; Mobile Teachers and District ALS Coordinators (DALSCs).